Research focuses on understanding coupling between seismic slip processes, fault strength, permeability enhancement and genesis of hydrothermal ore deposits in deforming rocks. Activities involve experimental, field-based, microstructural and modelling studies. The research team comprises Stephen Cox, Emeritus Fellow John Fitz Gerald, M.Phil student Kathryn Hayward, and technical staff Hayden Miller and Harri Kokkonen. Honours students Laura Fry and Adam Carmichael have also contributed. Collaborators include Janos Urai (RWTH-University of Aachen, Germany), and Arnd Flatten and David Beck (Beck Engineering, Berlin and Sydney respectively). During 2014, activities focussed on the following topics. The role of fluids in fault slip processes: Experimental studies are exploring the strength and mechanical behaviour of faults, and especially the role of reactive pore fluids in influencing slip processes on bare interfaces in quartz sandstone. A highlight has been the recognition of frictional melting of quartz during small stick-slip events in dry environments. We are also investigating the transition from purely frictional sliding in low temperature hydrothermal regimes to slow episodic slip processes during dissolution-moderated sliding at elevated temperatures. The experiments may shed light on processes influencing episodic tremor and slip phenomena down dip from the seismogenic regime in the continental crust and along subduction interfaces. Figure 1. Fault-hosted, gold-quartz vein system, Argo gold deposit, Kambalda, WA. Field of view is 5 m wide. Seismicity styles in high fluid flux faults: Seismicity styles associated with deep fluid injection experiments indicate that swarm seismicity is the characteristic response to injection of large fluid volumes into low permeability rock. The response of rock masses to fluid injection is being used to better understand the dynamics and rates of formation of hydrothermal ore deposits in high fluid flux regimes in fault zones. In particular, results indicate that mid-crustal, fault-controlled gold deposits, such as illustrated in Figure 1, form via fluid-driven earthquake swarm sequences involving up to thousands of microseismic ruptures during each of thousands of separate swarm sequences. Relationships between seismic moment release, net slip, swarm recurrence and injected fluid volumes indicate that large gold deposits can form in 104 - 105 years. Figure 2. 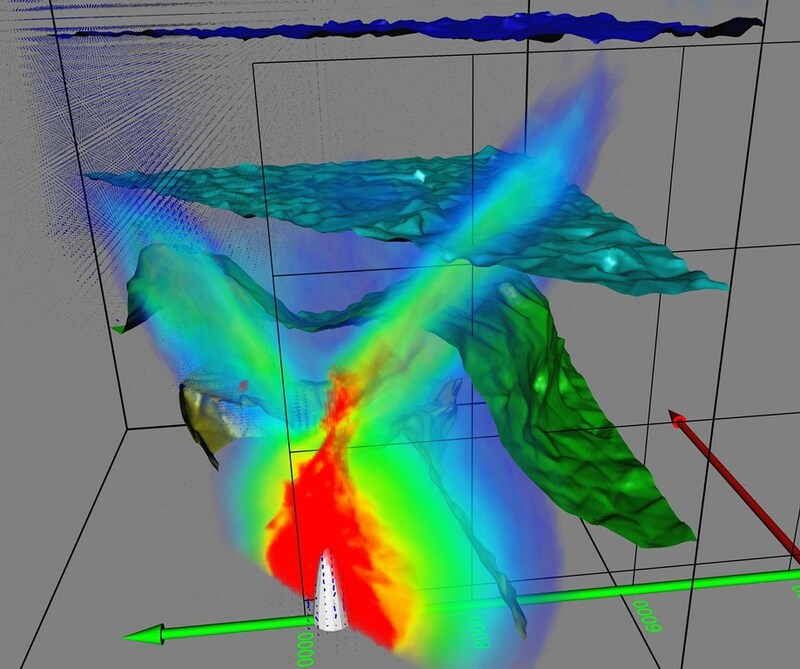 Visualisation of a segment of a 3D model of the fluid pressure distribution associated with discharge of overpressured fluid from igneous cupola (pink cone, bottom left). The orange zones are areas of pervasive, fluid-driven failure analogous to the core of a porphyry-copper system. In the blue-green domains fluid pressurization has re-activated existing faults and led to localisation of flow. Fluid pathways in intrusion-related hydrothermal ore systems: Growth of large arrays of mineral-filled fractures (veins) and reactivation of faults both play a key role in the generation of copper and gold resources in magmatic-hydrothermal systems. Field-based and numerical modelling studies are examining how fluid-driven failure processes influence vein formation, the generation of fracture-controlled fluid pathways, and distribution of metal resources in intrusion-related hydrothermal systems. Modelling has, for the first time, explored how fluid pressurization and related failure influences the dynamics of fluid pathways, stress states, and ore distribution in intrusion-related systems (Figure 2). Cox, S.F., 2007. Structural and isotopic constraints on fluid flow regimes and fluid pathways during upper crustal deformation: An example from the Taemas area of the Lachlan Orogen, SE Australia, J. Geophys. Res., 112, B08208, doi:10.1029/2006JB004734. Giger, S.B., Tenthorey, E, Cox, S.F. and Fitz Gerald, J.D., in press. Permeability evolution in quartz fault gouges under hydrothermal conditions.Giger, S.B., Tenthorey, E, Cox, S.F. and Fitz Gerald, J.D., in press. Permeability evolution in quartz fault gouges under hydrothermal conditions. Journal of Geophysical Research, B07202, doi: 10.1029/2006JB004828. Rolland,Y.,Rolland,Y., ,M., Cox,S.F., Pennacchioni, Mancktelow,G.N., and Boullier, A.-M. , 2007. Comment on “Alpinje thermal and structural evolution of the highest external crystalline massif: The Mont blanc “, by P.H. Leloup. N. Arnaud, E.R. Sobel, and R. Lacassin, Tectonics, 26, TC2015, doi:10.1029/2006TC001956. Barker, S.L., Cox, S.F., Eggins, S.M., and Gagan, M.K., 2006.Barker, S.L., Cox, S.F., Eggins, S.M., and Gagan, M.K., 2006. Earth and Planetary Science Letters, 250, 331-344. Micklethwaite, S. and Cox, S.F., 2006.Micklethwaite, S. and Cox, S.F., 2006. Progressive fault triggering and fluid flow in aftershock domains. Earth and Planetary Science Letters, 250, 318-330. Tenthorey, E. and Cox, S.F., 2006. Cohesive strengthening of fault zones during the interseismic period: An experimental study. Journal of Geophysical Research-Solid Earth, 111 (B9), B09202. Cox, S.F., 2005.Cox, S.F., 2005. Coupling between deformation, fluid pressures and fluid flow in ore-producing hydrothermal environments. Economic Geology,100th Anniversary Volume, 39-75. Rossi, M., Rolland, Y., Vidal, O. and Cox, S.F., 2005. 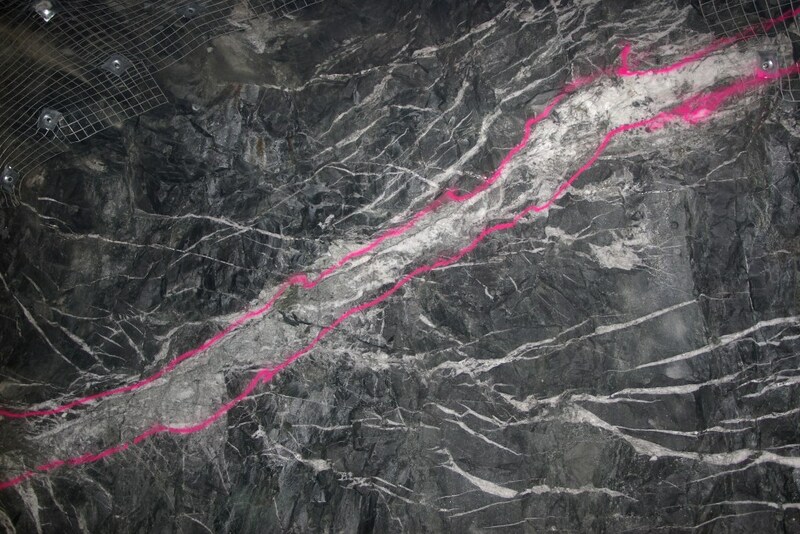 Geochemical variations and element transfer during shear zone development and related episyenites at middle crust depths: insights from the Mont-Blanc Granite (French-Italian Alps). Geol Soc London Special Publication, 245, 373-396. Zwingmann, H., Offler, R., Wilson, T. and Cox, S.F., 2004.Zwingmann, H., Offler, R., Wilson, T. and Cox, S.F., 2004. K-Ar dating of fault gouge in the northern Sydney Basin, NSW –Journal of Structural Geology, 26, 2285-2295. Cox, S.F. and Ruming, K., 2004. The St Ives Mesothermal Gold System, Western Australia - A Case of Golden Aftershocks?Cox, S.F. and Ruming, K., 2004. The St Ives Mesothermal Gold System, Western Australia - A Case of Golden Aftershocks? Journal of Structural Geology, 26, 1109-1125. Micklethwaite, S. and Cox, S.F., 2004. Fault segment rupture, aftershock-zone fluid flow, and mineralization.Micklethwaite, S. and Cox, S.F., 2004. Fault segment rupture, aftershock-zone fluid flow, and mineralization. Geology, 32, 813-816. Rolland, Y., Cox,S., Boullier, A.-M., Pennacchioni, G, and Mancktelow, N., 2003. Rare Earth and trace element mobility in mid-crustal shear zones: insights from the Mont Blanc Massif (Western Alps). Earth and Planetary Science Letters, 214, 203-219. Braun, J., Munroe, S. and Cox, S.F., 2003.Braun, J., Munroe, S. and Cox, S.F., 2003. Transient fluid flow in and around a fault. Geofluids, 3, 81-87. Tenthorey, E. and Cox, S.F., 2003. Reaction-enhanced permeability during serpentinite dehydration.Tenthorey, E. and Cox, S.F., 2003. Reaction-enhanced permeability during serpentinite dehydration. Geology, 31, 921-924. Streit, J E. and Cox, S.F., 2002. Evolution of fracture networks in shear zones: Insights gained from see-through experiments on biphenyl aggregates. Journal of Structural Geology , 24, 107-122. Tenthorey, E., Cox, S.F. and Todd, H.F., 2002. Evolution of strength recovery and permeability during fluid-rock reaction in experimental fault zones. Earth and Planetary Science Letters, 206, 161-172. Cox, S.F., 2002. Fluid flow in mid- to deep-crustal shear systems: Experimental constraints, observations on exhumed high flux shear systems, and implications for seismogenic processes. Earth, Planets and Space, 54, 1121-1125. Cox, S.F., Braun, J. and Knackstedt, M.A., 2001. Principles of structural control on permeability and fluid flow in hydrothermal systems. Reviews in Economic Geology, 14, 1-24. Streit, J.E. and Cox, S.F., 2001. Fluid pressures at hypocenters of moderate to large earthquakes. J. Geophys. Res., 14, 1-24. Zhang, S., Paterson, M.S. and Cox, S.F., 2001. Microcrack growth and healing in deformed calcite aggregates. Tectonophysics, 335, 17-36. Kanagawa, K., Cox, S. F., and Zhang, S., 2000. Effects of dissolution-precipitation processes on the mechanical behavior of quartz gouge at high temperature hydrothermal conditions. J. Geophys Res., 105, 11115-11126. Streit, J.E. and Cox, S.F., 2000. Asperity interactions during creep of simulated faults at hydrothermal conditions. Geology , 28, 231-234. Zhang, S., FitzGerald, J.G. and Cox, S.F., 2000. Reaction-enhanced permeability during decarbonation of calcite+quartz=wollastonite + carbon dioxide. Geology, 28, 911-914. Zhang, S. and Cox, S.F., 2000. Enhancement of fluid permeability during shear deformation of a synthetic mud. J. Structural Geology, 22, 1385-1393. Cox, S.F, 1999. Deformational controls on the dynamics of fluid flow in mesothermal gold systems. In: McCaffrey, K., Lonergan, L.and Wilkinson, J. (eds) , Fractures, Fluid Flow and Mineralization, Geol. Soc. London., Special Publications, 155, 123-139. Cox, S.F. and Knackstedt, M., 1999. Ore Genesis in fracture-controlled hydrothermal systems: Percolation theory approaches. In: Proceedings of PACRIM ‘99, International Congress on Earth Sciences, Exploration and Mining around the Pacific Rim (ed: G. Weber), The Australasian Institute of Mining and Metallurgy Publication Series, 4/99, pp 639-642. Streit, J.E. and Cox, S.F., 1998 Fluid infiltration and volume change during mid-crustal mylonitization in Proterozoic granite, King Island, Tasmania. J. Metamorphic Geology, 16, 197-212. Cox, S.F., 1998. Slickenlines produced experimentally at hydrothermal conditions. In: A.W. Snoke, J. Tullis and V.R. Todd (eds), Fault-related Rocks- A Photographic Atlas. Princeton Univ. Press., pp 136-137. Cox, S.F. , 1998. Vein development and fault-valve behavior in reverse faults. In: A.W. Snoke, J. Tullis and V.R. Todd (eds), Fault-related Rocks- A Photographic Atlas. Princeton Univ. Press., pp 130-135. Cox, S.F. and Etheridge, M.A., 1998. Microstructures in chalcopyrite mylonites. In: A.W. Snoke, J. Tullis and V.R. Todd (eds), Fault-related Rocks- A Photographic Atlas. Princeton Univ. Press., pp 412-415. Nguyen, P.T., Cox, S.F., Harris, L.B. & Powell, C.McA., 1998. Fault-valve behaviour in optimally oriented shear zones: an example at the Revenge gold mine, Kambalda, Western Australia. J. Structural Geology, 20, 1625 - 1640. Kanagawa, K. and Cox, S.F., 1996 Frictional behavior and microstructures of quartz gouge at high temperature hydrothermal conditions. Jour. Geol. Soc. Japan, 102, 223-231. Knackstedt, M.A. and Cox, S.F., 1995. Percolation and pore geometry of crustal rocks. Phys. Revs. E., 51, R5181-R5184. Cox, S.F., 1995. Faulting processes at high fluid pressures : an example of fault-valve behavior from the Wattle Gully Fault Zone, Victoria, Australia. J. Geophysical Research, 100, 12841-12859. Cox, S.F., Sun, S.-S., Etheridge, M.A., Wall, V.J. and Potter, T.F., 1995. Structural and geochemical controls on the development of turbidite-hosted gold-quartz vein deposits, Wattle Gully Mine, central Victoria, Australia. Economic Geology, 90, 1722-1746. Zhang, S., Cox, S.F. and Paterson, M.S., 1994. The influence of room temperature deformation on porosity and permeability in calcite aggregates. J. Geophys. Research, 99, 15761-15775. Zhang, S., Paterson, M.S. and Cox, S.F., 1994. Porosity and permeability evolution during isostatic hot-pressing of calcite aggregates. J. Geophys. Research, 99, 15741-15760. Siemes, H., Zilles, D., Cox, S.F., Merz, P., Schaefer,W., Will, G. and Schaeben, H., 1993. Preferred orientation of experimentally deformed pyrite measured by means of neutron diffraction. Mineralogical Magazine, 57, 29-43. Cox, S.F., Etheridge, M.A. and Wall, V.J., 1991. Fluid pressure regimes and fluid dynamics during deformation of low grade metamorphic terranes: Implications for the genesis of mesothermal gold deposits. In: "Greenstone Gold and Crustal Evolution", NUNA Conference Volume (edited by F. Robert, P.A. Sheahan and S.B. Green). Geol. Assoc. Canada, Mineral Deposits Division, pp 46-53. Cox, S.F., Wall, V.J., Etheridge, M.A., & Potter, T.F., 1991. Deformational and metamorphic processes in the formation of mesothermal vein-hosted gold deposits - examples from the Lachlan Fold Belt in central Victoria, Australia. Ore Geology Reviews, 6, 391-423. Cox, S.F., Etheridge, M.A., Cas, R.A.F., and Clifford, B.A., 1991. Deformational style of the Bendigo-Ballarat Zone, Castlemaine area, Victoria — Implications for evolution of crustal structure in central Victoria. Aust. J. Earth Sci., 38,151-170. Cox, S.F., and Paterson, M.S., 1991. Experimental dissolution-precipitation creep in quartz aggregates at high temperatures. Geophysical Research Letters, 18, 1401-1404. Cox, S.F., and Etheridge, M.A., 1989. Coupled grain-scale dilatancy and mass transfer during deformation at high fluid pressures, Mt Lyell area, Tasmania. J. Struct. Geol., 11, 147-162. Cox, S.F., 1989. The Cape Sorell Inlier and King Island. In Geology and Mineral Resources of Tasmania (C.F. Burrett and E.L. Martin, Eds), Geol. Soc. Aust. Spec. Publn, 15, 25-27. Cox, S.F., Etheridge, M.A. and Wall, V.J., 1987. The role of fluids in syntectonic mass transport, and the localization of metamorphic vein-type ore deposits. Ore Geology Reviews, 2, 65-86. Cox, S.F., 1987. Flow mechanisms in sulphide minerals. Ore Geology Reviews, 2, 133-171. Cox, S.F., 1987. Antitaxial crack-seal vein microstructures and their relationship to displacement paths. J. Struct. Geol. 9, 779-787. Cox, S.F., 1986. High temperature creep of single crystal galena (PbS). In:"Mineral and Rock Deformation - Laboratory Studies", Geophys. Monogr. Ser. 36, AGU Washington, (eds. B.E. Hobbs and H.C. Heard), pp 73-98. Etheridge, M.A., Wall, V.J., Cox, S.F. and Vernon, R.H., 1984. High fluid pressures during regional metamorphism and deformation - implications for mass transport and deformation mechanisms. J. Geophys. Res., 89, 4344-4358. Cox, S.F.and Etheridge, M.A., 1984. Deformation microfabric development in chalcopyrite in fault zones, Mt. Lyell, Tasmania. J. Struct. Geol., 6, 167-182. Cox, S.F. and Etheridge, M.A., 1983. Crack-seal fibre growth mechanisms and their significance in the development of oriented layer silicate microstructures. Tectonophysics, 92, 147-170. Cox, S.F. and Etheridge, M.A., 1982. Foliation development in hydrothermally altered acid volcanics. Atlas of Rock Cleavage, (eds. G.J. Borraidaile, B.M. Bayly, C. McA. Powell), pp 304-305, 420-423. Cox, S.F., 1981. The stratigraphic and structural setting of Mt. Lyell volcanic-hosted sulfide deposits, Western Tasmania. Econ. Geol. 76, 231-245. Cox, S.F., 1981. Etheridge, M.A. and Hobbs, B.E. The experimental ductile deformation of polycrystalline and single crystal pyrite Econ. Geol., 76, 2105-2117.